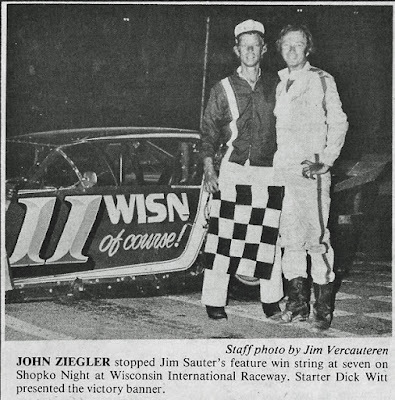 Kaukauna, Wis. (July 2, 1981) – Jim Sauter’s seven-week winning streak was snapped by John Ziegler Thursday night at Wisconsin International Raceway before a record crowd of 7,814 wildly cheering fans. Ziegler won the 20-lap late model event by six inches at the finish as he and Sauter came down the front stretch of the half-mile paved oval door-to-door with Ziegler on the inside and Sauter on the outside. The huge crowd established a modern-day record for Wisconsin weekly auto races, Fox River Racing Club officials noted that nearly 1,000 rain checks from the previous week had not been used, upping the paid attendance for the event to 8,797. Earlier in the evening, Sauter’s car was damaged by another driver who was irate after an accident in the fifth heat. Sauter and Wayne Roffers were battling for second position when on the final lap, the two collided, sending Roffer’s car into the front stretch wall at full speed. Afterwards, Roffers took a hammer to Sauter’s parked car and smashed the windshield and then proceeded to hammer away at the hood of the car. Roffers was immediately barred from racing for two weeks by racing club officials. Sauter’s crew was able to make the necessary repairs to get it into the feature race. Jim Vandenberg came off the front row to pace the feature field for the first five laps. Ted Musgrave slipped around Vandenberg and pulled to a 10-car length lead as Alan Kulwicki moved into second position followed by Sauter and Ziegler. Ziegler got under Sauter for third place on lap 13 and he and Kulwicki came together in the first turn on lap 15, sending Kulwicki’s car into a spin. The race was restarted with Ziegler and Sauter glued to Musgrave’s bumper. Ziegler motored to the inside of Musgrave entering turn one on the 17th round and Sauter followed him through the hole and chased him right down to the checkered flag. Musgrave finished third, not far off the pace, followed by Rich Somers, Cliff Ebben and Terry Baldry. Heat #1 – Jim Weber, Roseville, Minn.
Heat #2 – Bob Loch, Greenfield, Wis.
Heat #3 – Gordie Sannes, DePere, Wis.
Heat #4 – Ted Musgrave, Grand Marsh, Wis.
Semi-feature – Dave Valentyne, Kimberly, Wis.
1. John Ziegler, Madison, Wis.
2. Jim Sauter, Necedah, Wis.
4. Rich Somers, Minocqua, Wis.
5. Cliff Ebben, Appleton, Wis.
6. Terry Baldry, Omro, Wis.
8. Jerry Wood, Cottage Grove, Wis.
9. Terry Anvelink, Naverino, Wis.
10. John Geske, Appleton, Wis.